It’s Valentine’s Day, and poor Trusty the Mail Truck has broken down. 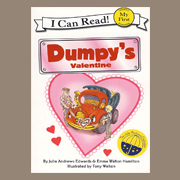 Dumpy offers to lend a hand, and with Charlie and Pop-Up’s help he delivers surprises all over town. But what about Trusty? Will he get a valentine this year?